Wedding PR: Reader's Digest, Catersource, StyleCaster and more! Wedding PR: Reader’s Digest, Catersource, StyleCaster and more! It’s time for another awesome client feature roundup! This week we’ve got features in Reader’s Digest, Catersource, StyleCaster and so much more- check it all out below. 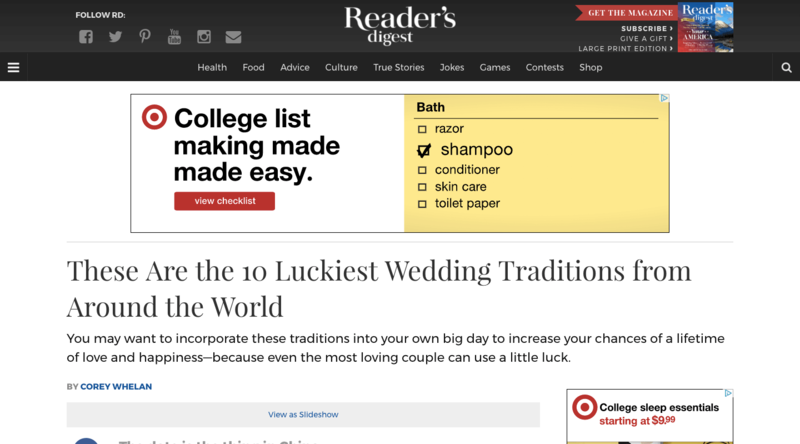 Destination Weddings Travel Group was featured in the Reader’s Digest article, The 10 Luckiest Wedding Traditions from Around the World. See the full feature here. Belladeux Event Design was featured on Social Tables with her guest article, When to Do it Yourself and When to Hire a Professional Event Planner. Seethe full article here. Cocoon Events Management Group was featured on Social Tables with their guest article, 5 Things to Look for When Selecting a Destination for Your Event. See the full article here. OFD Consulting was featured on Social Tables with her guest article, How Venues Can Prepare for a Busy Event Season by Leveraging PR. See the full article here. International Academy of Wedding and Event Planning and Cocoon Events Management Group were featured on StyleCaster in their article, 15 Meaningful, Not-at-all-Cliche Quotes to Read at Weddings. See the full feature here. OFD Consulting, Emily Sullivan Events, International Academy of Wedding and Event Planning, and Belladeux Event Design were featured on Tidewater and Tulle in the article, 5 Unexpected Things You’ll Face in the Last Stretch of Wedding Planning. See the full article here. 100 Candles was featured on Catersource with their guest article, Summer Lighting Challenges for Outdoor Events. See the full article here. Where Will They Stay? was featured on Honeybook with their guest article, Are You Ready to Start a Side Hustle? See the full article here. Destination Weddings Travel Group was featured on Catersource with their guest article, Emerging Elopement Spots. See the full article here. OFD Consulting was featured on Honeybook with her guest article, Handling Media Mistakes with Grace. See the full article here.